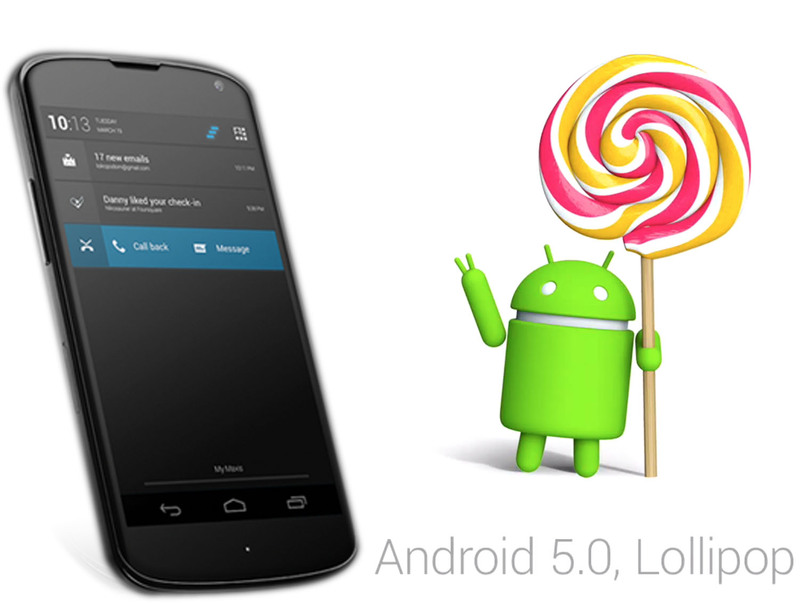 Google has launched Android 5.0 Lollipop, making its debut on the Nexus 6 and Nexus 9 devices. the latter of which went on sale today. When will Android 5.0 Lollipop be on your phone and Tablet. As I know that, HTC, LG Mobile, Motorola, Nvidia, Samsung and Sony Mobile have launched that some of theirs and tablets will receive updates later. Regarding the models, you can check those providers’ official blog. Most of new released mobile phone and tablets will use Android 5.0 Lollipop OS. I don’t suggest people to update the version once launched. We all know that the new version OS is not stable. There are some bugs. So we can update it later when the product is matured. Android 5.0 Lollipop is upcoming on Phone and Tablet, For security of android phone and tablet, we should pay more attention to it in case of important data stolen by hackers. We can use public hotspot WiFi almost everywhere. I know many guys would like to ask is there any WiFi when arriving one place. But it is very risk to connect public Wifi for many guys are using the wifi. It is very easy to access your devices with Wireshark software. How can we use public wifi safely? The way is using VPN on mobile devices. VPN can create secure layers for data on your phone. So what we should connect VPN on devices while using public wifi. Read steps as follows to configure VPN on android 5.0. 1. Go to Settings – More – VPN – Add VPN profile. 2. Name: Input whatever you want. 3. Type: PPTP or L2TP/IPSec. 4. Server address: Ask your VPN provider. 5. Username: Your VPN Account. 6. Password: Your VPN Account password. 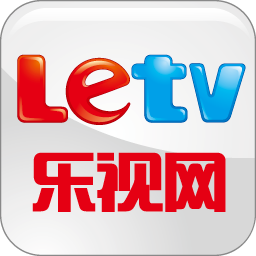 If you haven’t find best VPN providers for android devices, you can test with FlyVPN trial VPN services. 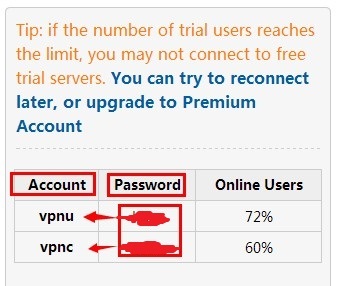 Obtain trial VPN account and password on http://www.flyvpn.com/freetrial. Please focus on the right side of the trial page. You will see the account info as photo below. Many mobile and tables will be updated to Android. I list some models I know which will use Android 5.0 Lollipop. There is Nexus 4, Nexus 5, Nexus 7, Nexus 10, HTC One M8 and M7, LG G3 Moto X, Moto G, Moto G with 4G LTE, Moto E, Droid Ultra, Droid Maxx, Droid Mini, Nvidia Shield Tablet, Samsung SGS5 and Note 4, Sony Xperia Z family, including Xperia Z, Xperia ZL, Xperia ZR, Xperia Tablet Z, Xperia Z1, Xperia Z1S, Xperia Z Ultra, Xperia Z1 Compact, Xperia Z2, Xperia Z2 Tablet, Xperia Z3, Xperia Z3v, Xperia Z3 Compact and Xperia Z3 Tablet Compact and Sony Z Ultra mobile will update to Android 5.0 Lollipop. When you are using public wifi, don’t forget to use VPN to protect your phone and tablet. HK Line official account is online now.Line users can get a new sticker by adding friends and concerning HK Line latest news.Only users with HK IP can get it. 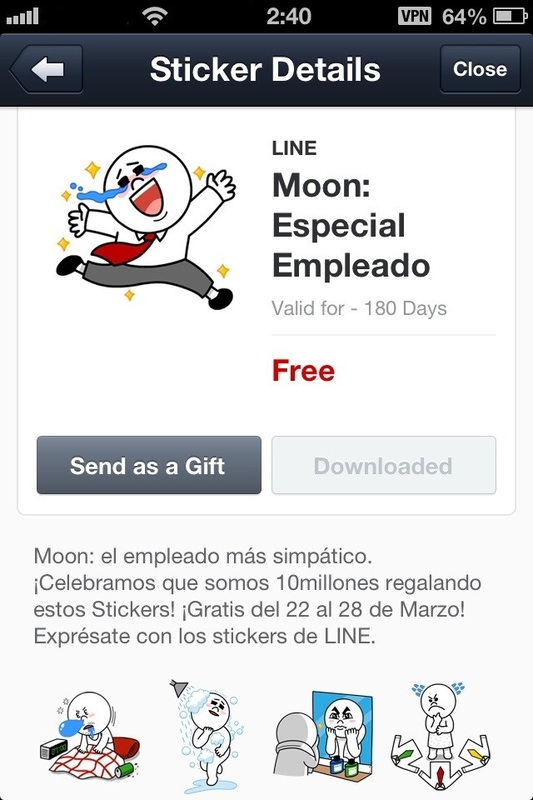 This activity will expired on 4th May,2013.Line users have got it from Taiwan.If you have got it.Please grab this chance.Use stickers to express yourselves.Get new free Line sticker from HK with Flyvpn free HK VPN. Please follow me to get new stickers. (1) Setup vpn on android,iPhone,iPod or other devices. Setting HK vpn on Android: http://www.flyvpn.com/How-to-setup-VPN-on-Android.html#.UWJyvaLEd5e . Setting HK vpn on iPhone,iPod: http://www.flyvpn.com/FlyVPN-iPhone-iPad-iOS-L2TP-VPN-Setup-Tutorial.html#.UNkvjZN27_c . Setting HK vpn on Mac OS: http://www.flyvpn.com/FlyVPN-VPN-Setup-Tutorial-for-PPTP-and-L2TP-on-Mac-OS.html#.UNkvIZN27_c . Free HK VPN Server: 118.142.91.205 . 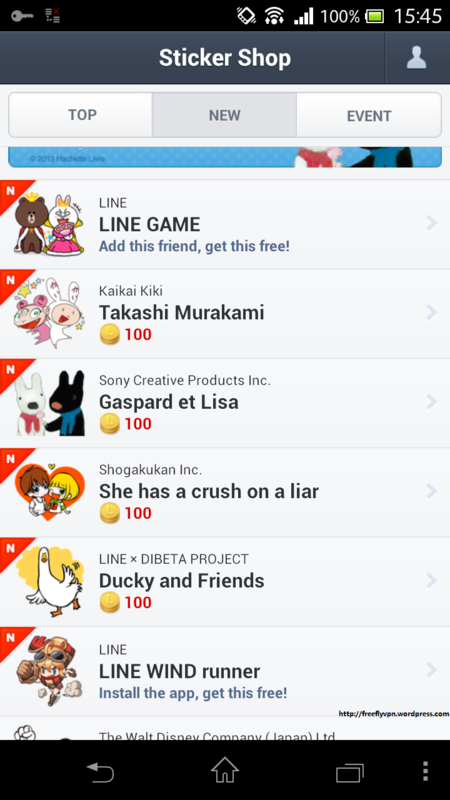 (2) Connect HK VPN Successfully.Then you will find a new line sticker in sticker shop. 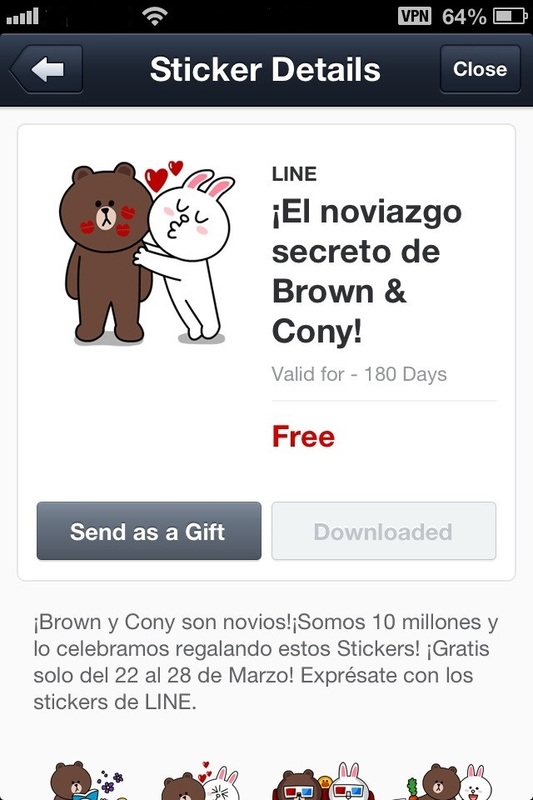 (3)Then add friends and download stickers. Change ip into HK with Flyvpn. 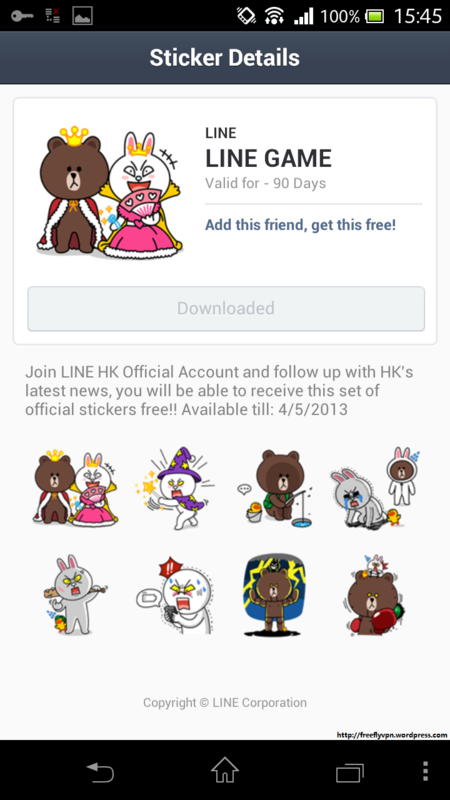 Get free Line sticker from HK is so easy.Follow me to get more and more stickers. Anyone want to reproduce this article.Please note the address: https://freeflyvpn.wordpress.com/2013/04/08/free-hk-vpn-server-for-line-sticker/ .